Update for November, 2017: This is the first fall I can remember where I have actively gardened but haven’t employed any season-extension techniques. I am, typically, a huge fan of year-round gardening, cloches, and all manner of garden hacks that let me extend my fresh-veg season beyond the normal growing season. This year has been more of a re-building year, however. I completely reworked my garden in the spring, ripping out all of my established, hard-sided garden beds. This year’s new, mounded beds have a more organic look and have been a nice change, but all my season-extension infrastructure was based around those hard sided beds. I also got started so late (I didn’t really plant anything before May) that the bulk of my planting was summer stuff: tomatoes, peppers, squash. 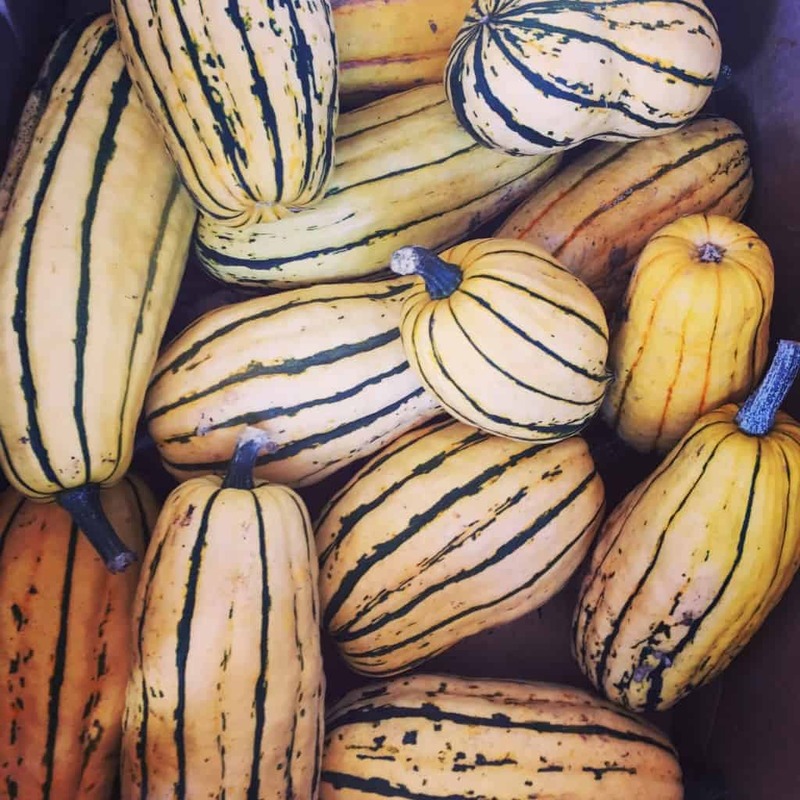 As it turned out, that gamble paid off pretty well for me, and it was a great year for winter squash, tomatoes, and cucumbers. But those crops were still going strong in July and August, when the bulk of fall crops are planted around here, so I only really planted around the edges of the garden, where I could squeeze a little room, and in two big containers I had lying around. The upshot of all this? I just don’t have a very large fall garden, and it’s not planted in a way that makes standard season extension techniques particularly simple to pull off. My plan is to harvest, enjoy, and not worry too much about fussing over the garden this fall. With regards to weather, as I write this a freakishly early-season snow flurry is falling, so that’s fun. Otherwise, everything about this fall has felt totally, completely normal. I anticipate mostly standard stuff: fairly consistent rain or drizzle, periodic wind, possible big windstorms, lots of cloud cover, and mild, cool temperatures dipping into frost territory periodically. November in the garden is – blessedly – slow. After a big push of preserving and harvesting, November only asks for only a little clean-up and mulching while waiting for the gardener to harvest as she likes. The biggest deal in November is first frost and wind – so this is a great time to make sure your cloches are hardy enough to stand up to the occasional gale while buying your veggies a few degrees cold protection. In the Seattle area first frost usually occurs in November. Depending who you ask, the average is anywhere from November 2 to November 17th. In any event, the hard frost date will vary so much year to year that the best you can do is keep an eye on the temperature and the forecast and have your cloches and deep mulch in place. You can place your bare root fruit trees and shrub order this month, or if a local nursery is carrying the varieties you want, go ahead and plant! It’s not too late to put up cloches, deep mulch beds or otherwise cover fallow ground to protect it from winter rains. Your garlic is already planted? Right? Right?! There’s nothing you can seed now which will be harvestable this season, but if you want you can roll the dice for overwintering crops. Overwintering early spring greens. 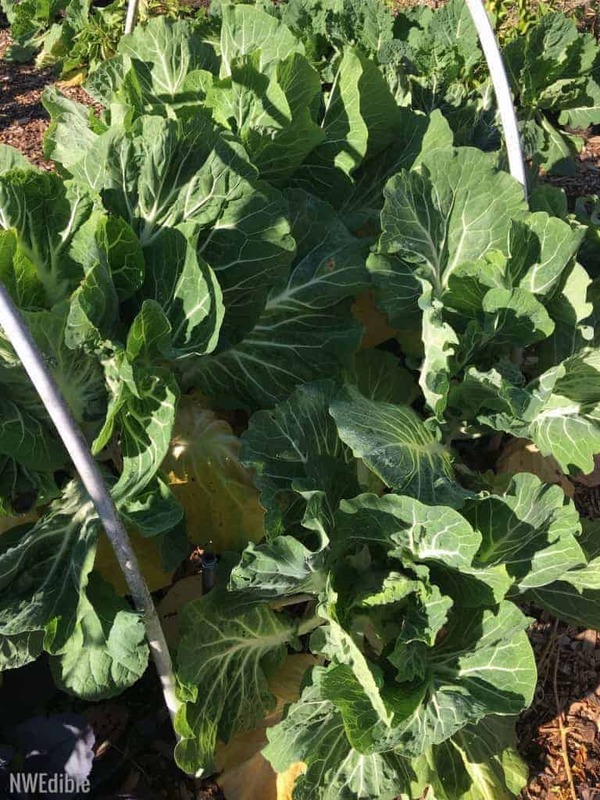 I would still throw some spinach, mustard or kale seed under a cloched bed as late as early November with an eye towards early greens next spring. If you are in a slightly warmer climate (I’m looking at you, Oregon and Northern California) I’d push it with carrots, beets, and lettuce, too. There’s no guarantee this late, but if you end up with carrots in early April, won’t you be glad you took the risk? Bare root trees and perennial shrubs. Divide and replant perennials like rhubarb, cane fruit, and strawberries. Onions & garlic – from storage. Lettuce, spinach, frisee and other cool weather greens. Finish weeding and mulching any empty beds to protect your soil from compaction. 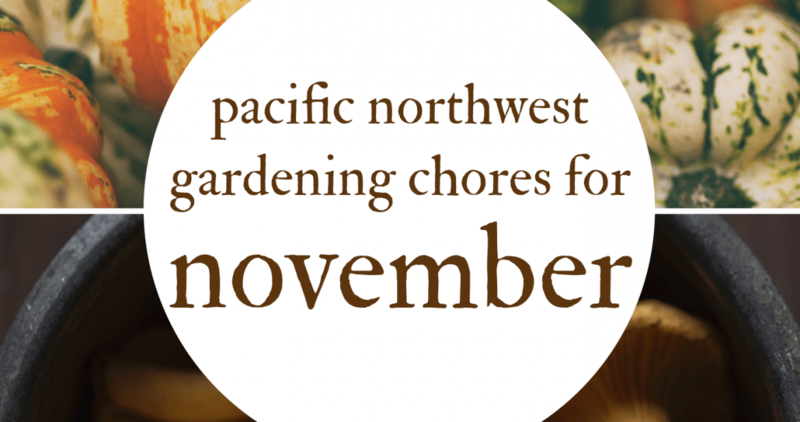 Leaves, compost, straw, cardboard – you can mulch with just about anything. I do recommend mulching with something that will rot. Protect sensitive perennials from frost through heavy, deep mulching and, if needed, through frost covers. Collect dried seed heads and dry completely inside for planting in the spring, or winter-sow by scattering seed now where you’ll want it to grow next year. Take care of maintenance on your garden tools. Sharpen your pruners, brush the rust off your shovel and oil the metal, oil or paint any wooden handles on your tools, etc. Store your tools away someplace dry. Get your lawn mower blades sharpened, and schedule any needed service for garden power equipment. Drain garden hoses, coil them up and store them. If you have an irrigation system, drain the pipes and winterize. Cover vulnerable valves or spigots with foam covers. 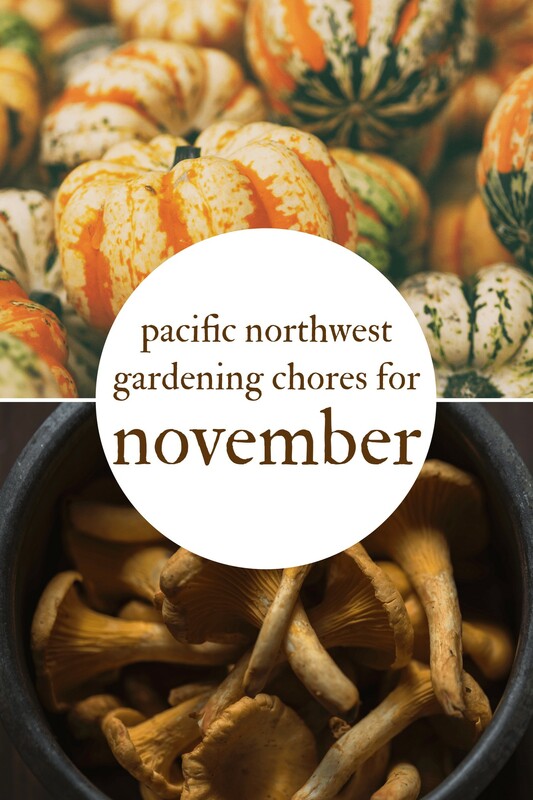 How’s your November garden? Are you happy to have put the garden beds to bed? In Montana, we harvested a majority of our carrots yesterday — the last crop to come out of the ground. We will leave some under straw to harvest on a warm late winter/early spring day. The big vegetable garden is tilled and put to bed. Herb gardens have had some frost, but are still giving us parsley and sage. Fennel is hanging in the cold room and the aroma is intoxicating. 200 pounds of potatoes should see even our Irish family through the bulk of winter. The hanging tomatoes in the cold room continue to give us about 10 pounds every couple of weeks. Our harvest is done, the garden is covered with about 1 foot of shredded maple leaves, threw in a bunch of wood ash and it is soon to be covered with snow. The herb pots are in until May. We don't overwinter anything, extend season etc. Just have to keep a path tramped down to the compost pile. The dining table is covered with about 10 trays of red and green tomatoes. We will cook with these daily til they are gone…I don't can with them as I heard end of season tomatoes get too low in acid. I will freeze some if have enough for a quart at a time. I've still got tomatoes going! Woot woot! Put in peas, favas, lettuce and bok choy and am leaning on the hens to keep producing. This year did get a bit crazy late with the warm weather, didn’t it?